So Got Schooled: In the Tower, On the Field. 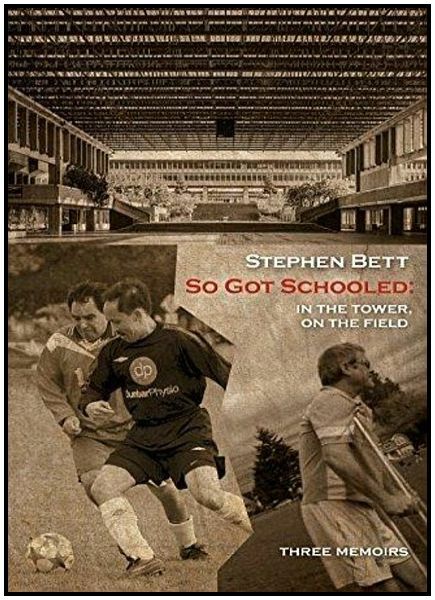 Did my time, took my chances"
So Got Schooled: In the Tower, On the Field, a survivor of the Canadian hinterland, Stephen Bett, Poet turned memoir writer serves up the soup with all the ingredients of a good read. Stephen Bett is a Canadian Poet, having written 18 books of poetry. He is widely published in journals internationally and in North America, his personal papers are being collected by the Archives at Simon Fraser University. He is best known for his poetry collections including, Breathing Arizona: A Journal, Sound Off: a book of jazz and Un/Wired. www.stephenbett.com. This personal memoir is divided into three parts, his time in Vancouver coaching a men’s over 50’s soccer team, his time in an Anglican Boy’s School in the 1950’s and his experiences of cliques at Simon Fraser University where he studied for his Phd. His time as a coach and player of soccer is full of humorous personality sketches of the players, referees and other coaches. An interesting inside look at the male animal, his psyche, his motivations, his wide range of behavioural differences, the alien in a situation requiring skill and cooperative behaviour. There were few baseline rules, “pay your dues”, “80% mandatory attendance”, “team shirts were team and sponsor property” and “no assholes allowed”. The stories run the gamut of comparisons to kids in a kindergarten, power plays, the donnas who hogged the ball, cultural differences, players who were too rough or acted up, did not show up for games and how the management of the team flowered with observations and insights as well as user friendly and inclusive attitudes into a solid club. To give an example of the flavour of the writing, the following are some of the titles of chapters: “Dragan, Dragan Bo Bragan, Fee Fy Flag’em and Drag’em”, “Devon, Devon Bo Bevon, Fee Fy Fly No Heaven”, “Roy, Roy Bo Boy, Fee Fy Quick to the Rise Doughboy” and more. His teenage years in an Anglican Private Boy’s School in the 1950’s were subtly horrific, told with the light touch of the past, many years ago. As if “Lord of the Flies” revisited, an all-male hierarchy with a staunch us vs. them, students vs. teachers more, a resident student caught crying with homesickness is wrestled into a straight jacket. Outright confrontation invites open violence by the “bully-boy” teachers. Creative passive resistance is practiced on the less intimidating ones, from spit balls to sneaking out the first-floor window and then coming round and knocking on the classroom door for admittance when the teacher’s back is turned. A time when corporal punishment was the norm, “delinquent” young people were caned and detentions were meted where they were enlisted to help build the new chapel. The young Bett living in his own world, becomes the regular target of abuse and resists. As an adult he attends university, studying English at Simon Fraser University in Vancouver, an interesting story about Poet/Professor Robin Blaser and the new post-doctorate program with the inside politics and wrangling that caused Bett to be unfairly dismissed from the program. Despite this he finds work as a College English teacher and has a teaching career for over 30 years. The writing is a first-person narrative, original, disjointed free form, with instances of poetry in prose. Occasionally new words present themselves, happy occurrences that unexpectedly brighten the page. The writing presents an English humor, Canadiensis male at play with an underlying sardonica. A not to be missed study of the Canadian male, true and in sendup, humor hot and fly. Bett having grown into adulthood during the tumultuous 1960’s gives a distinct enlightening from the libertarian Peace and Love, time of Eden, time of awakening. The memoir rolls out personal and inviting, it is as if the Reader is sitting with Bett in a pub bonding over a beer and into the night, having a laugh, the stories shine. The world of men and the halls of academia in sendup, a distinctly Canadian write, So Got Schooled: In the Tower, On the Field by Stephen Bett. Available @ Amazon United States. Amazon.com.